Eisenhower’s historic decision illustrates the importance of properly weighing risk. He went on to estimate they could lose up to half of the paratroopers and one-third of the gliders. 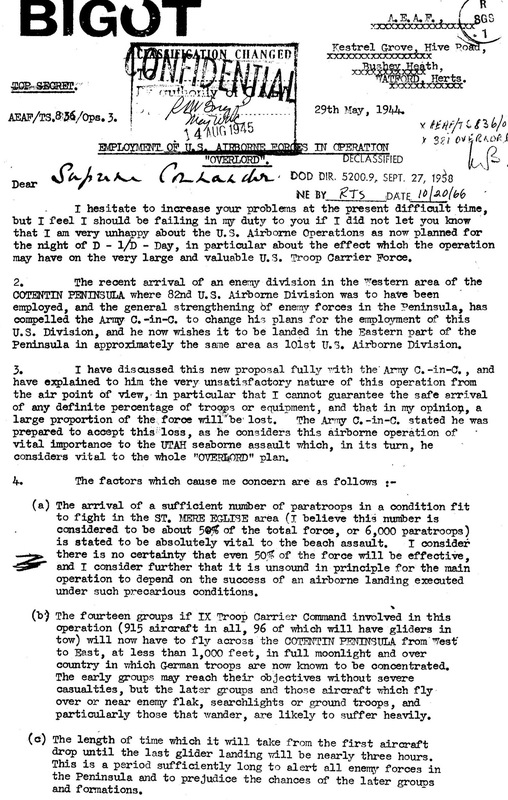 He followed the letter up with a personal visit the next day, warning that loses could cost up to 70% of the glider force; Eisenhower would be “throwing away two airborne divisions.” Faced with a difficult choice, Ike subsequently directed his commanders to review “to the last detail every single thing that may diminish the hazards” and that “a strong airborne attack in the region indicated is essential to the whole operation...It must go on.” Ike recognized that in avoiding the tactical risk to his airborne forces, he would potentially expose his western flank landing site—Utah beach—to direct German counterattack at its most vulnerable point, the beachhead. This, in turn, would expose subsequent beaches to flank attack. This increased operational risk could lead to the strategic risk of being pushed off all of the beaches. Having carefully weighed the tactical risk, he decided it was necessary to continue the airborne operation to avoid strategic risk and failure. Eisenhower’s historic decision illustrates the importance of properly weighing risk. As a concept, risk is relatively straightforward. Joint Publication 3-0 defines it as the “chance of failure or unacceptable results.” However, while it may be straightforward to define, its specific articulation to allow decision makers to appropriately weigh it is difficult. Often presented through a stoplight chart (red/amber/green) or as a scale (high/significant/moderate/low), this terminology can be vacuous. Since military decisions are some of the most momentous civilian and military leaders can make, as Eisenhower’s decision illustrates, it is important that we move beyond generic terms and articulate risk in an explicit and tangible fashion. Done properly, risk articulation allows decision-makers to become more sensitive to the choices available and to subsequently identify when a plan is off track, i.e., when potential risk is coming to fruition. This, in turn, improves initial decisions and allows them to identify future decision points. To better articulate risk, first, we should be cognizant of the levels of war—tactical, operational, or strategic—and ensure we subordinate the tactical and operational levels to the strategic. Accepting higher tactical risk that will result in reduced strategic risk, such as Eisenhower’s decision to execute the airborne operations by the 82nd and 101st Airborne Divisions, is a worthy proposition. However, lowering tactical risk at the expense of increased strategic risk, as cancellation of the jumps and glider landings would have done, is a poor choice. Second, instead of providing a composite assessment, specific variables should be addressed individually—to include time, troops, blood, treasure, escalation, and ends. These variables can provide a tangible illustration that allows decision makers to make their own judgment about risk by weighing potential costs (and the uncertainty surrounding these estimates) against perceived benefits to determine if the results are acceptable. Furthermore, these variables generally translate between the operational and policy/political domains. This allows senior military leaders to provide an operational assessment while simultaneously allowing civilian leaders to make appropriate policy/political assessments without the military having to wade into discussions that are primarily political—the realm of the civilian leadership. Lastly, these variables should be articulated by telling a story of alternative options. Stories provide a narrative of the future gains that can be earned and likely costs to be suffered through particular options. In the end, better risk articulation through the “unequal dialogue” fulfills the military leadership’s responsibility to serve their civilian leaders while simultaneously serving soldiers, airmen, sailors, and marines by shaping better-informed decisions in pursuit of national objectives. Coined in the late 1940s, Miles’ Law captures an eternal truth that one’s perspective provides a particular lens through which one views problems and the efficacy of potential solutions. Since war is a continuation of politics through other means—violence—and strategy is the plan and process through which these means are applied to achieve the political objective(s), this analysis will rely on strategic risk as the default lens. When looking at the strategic level, and thus war, the use of Clausewitz’s Trinity is instructive. The remarkable, or primary, trinity looks at the interplay between war’s dominant tendencies of passion, chance and reason, while the secondary trinity generally relates these forces to the people, army (military), and government. The military’s role is to bridge military operations that operate in the realm in chance, and thereby are subject to risk, to the policy objectives via strategy. However, policymakers are also part of strategy development and execution since they man the strategy bridge on the policy end. The perspective they bring to the unequal dialogue is one that must also directly consider the passions of the people—will they support the effort and sacrifice required to obtain the policy objectives, and how do they manage these passions? On the other end of the bridge, the unequal dialogue is critical in harnessing military expertise on how force or the threat of force can be used in conjunction with other instruments of national power to accomplish policy objectives. This description of expected and potential costs allows policymakers to use their political expertise to determine if the perceived benefit of achieving the policy objective outweighs these costs. Since red/amber/green and high/significant/moderate/low are unhelpful in describing risk, the use of dual-use variables—variables with both operational and political meaning—is required. Potential variables include: time, troops, blood, treasure, escalation, and ends. Each of these variables can be explicitly defined, providing a tangible description to policymakers that allows them to probe the basis and certainty of the estimates and judge a particular option not only on its operational merits, but on its political merits as well. Since specificity tends to generate more focused questions, it also serves to impose a greater discipline on military staffs and commanders in developing the assumptions and causal logic behind the variables. Lastly, it promotes greater transparency, which can help to build trust in the political-military relationship. While the example only addresses time, troops, and ends, one can imagine how a classified story, whether in private with the president, at a National Security Council meeting, or in a closed-door session with the appropriate Congressional committee, could address the other variables identified above—time (providing an operational timeline for deployment and execution), blood (the number of expected casualties based on the size of the force and particular operational design), and escalation (e.g., how Russia, Iran, or Hizbollah might react). Additionally, given the classified venue, the Chairman could also discuss the certainty surrounding each of the estimates. In communicating a range of options, the stories in the letter sketch tangible, plausible future states and the potential range of costs to achieve them, providing the ability for policymakers to weigh the costs and benefits of the various options, including the option to continue the status quo. This best military advice serves to inform both an operational and political assessment of risk, while the specificity can generate a robust political-military dialogue, helping to tease out assumptions and the logic behind the theory of victory presented in the options. In the end, providing an explicit and tangible articulation of risk allows military leaders to best inform strategy development and execution. This not only ensures better alignment of ends, ways, and means that will maximize the probability of accomplishing the desired policy objectives, it also ensures that national blood and treasure will not be needlessly spent through poorly developed strategy. Mike Shekleton is a U.S. Army officer. The author would like to thank Adelaido Godinez and The Strategy Bridge team for reading the draft and providing suggestions. The opinions expressed are his own and do not reflect the official position of the U.S. Army, the Department of Defense, or the U.S. Government. Rick Atkinson, The Guns at Last Light: The War in Western Europe, 1944-1945, Henry Holt and Company: New York, 2013, 82. Sherman Kent’s classic writing “Words of Estimative Probability” found wide variance in interpretation of word estimates. Motivated by a question on a National Intelligence Estimate (NIE) that used “serious probability,” Kent found that while he gave the wording a interpretation of 65% probability, the interpretations of his colleagues ranged from 20 to 80%. Despite agreement on the wording, this “agreement” overlooked fundamental disagreement over the probability. For a similar perspective on this, Neustadt and May discuss the same interpretative variance in Thinking in Time: The Uses of History for Decision Makers (1986), encouraging decision makers to probe subjective probability assessments by asking for numerical odds (page 152). The idea to articulate risk during the provision of military advice in the form of a story using time, troops, blood, and treasure came from Dr. Steve Biddle during a dinner with the Basic Strategic Art Program (BSAP) class in Carlisle, PA. This is not much different than how a staff would communicate risk for courses of action (COAs) to a commander by discussing evaluation criteria during COA comparison. In fact, JP 5-0 lists time and casualties as two suggested variables to use as evaluation criteria. This definition of strategy borrows from attributes of strategy communicated by Colin Gray and Wick Murray and Mark Grimsley. While Gray discusses strategy as a plan in “The Strategist as Hero” in Joint Force Quarterly, 3rd Quarter, 2011 (page 39), Murray and Grimsley state that strategy is a “process of constant adaptation” in The Making of Strategy: Rulers, States, and War (page 1). See Michael Fitzsimmons, “The Problem of Uncertainty in Strategic Planning,” Survival: Global Politics and Strategy, Winter 2006-7, pages 142-3. Matthew Moten, Presidents and their Generals, Belknap Press of Harvard University Press: Cambridge, Massachusetts, 2014, 217. For more on differing interpretations of risk, see Davidson, Janine, “Civil-Military Friction and Presidential Decision Making: Explaining the Broken Dialogue,” Presidential Studies Quarterly, March 2013. This letter was based on a request the previous day during his re-confirmation hearing.